See a comparison of the Mexican Green and the Mexican Red with a soda can. 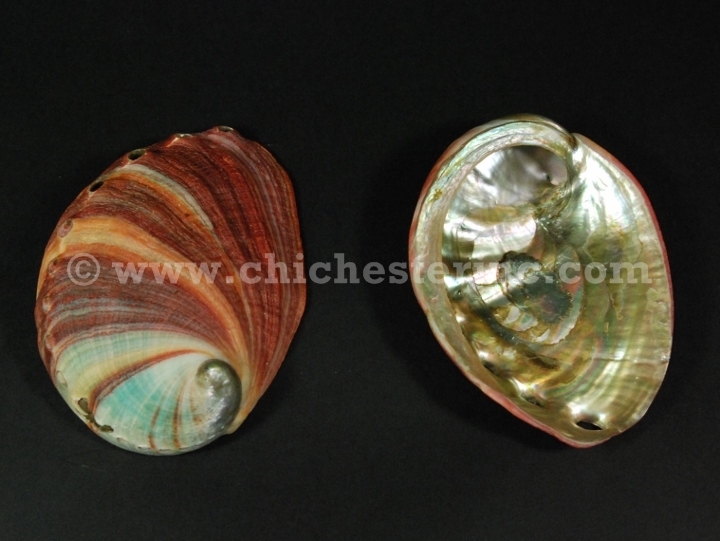 Left: Mexican Green 4"-5"; Right: Mexican Red 4"-5"
These abalone shells have been cleaned, bleached, and treated in muriatic acid and/or dipped in a light coating of resin. The outside of the shell is clean, but still rough. They are not recommended for use in food consumption. The sizes have been obtained by measuring the longest side of the shell. We weighed a random 5"-6" abalone shell as 4 oz., and a group of four 5"-6" as 1 lb. Genus and species of Red Mexican Abalone: Haliotis rufescens, ranch. 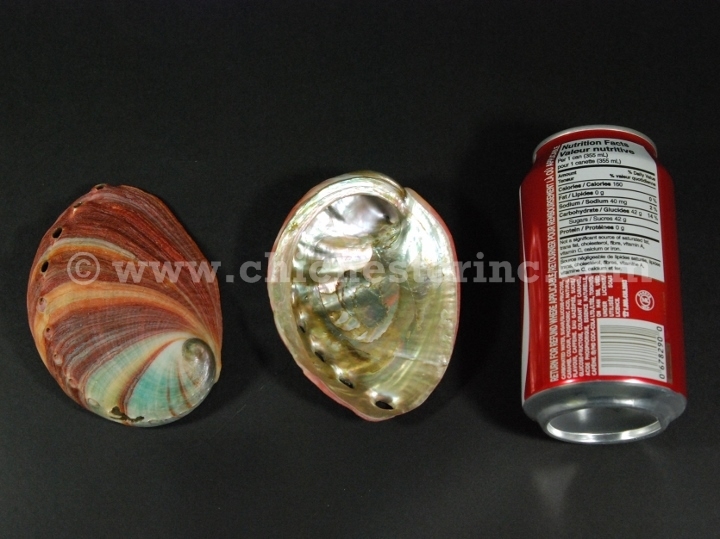 The Red Mexican Abalone shells are not for sale in California, Oregon, or Washington State. Genus and species of Green Mexican Abalone: Haliotis fulgens, wild. 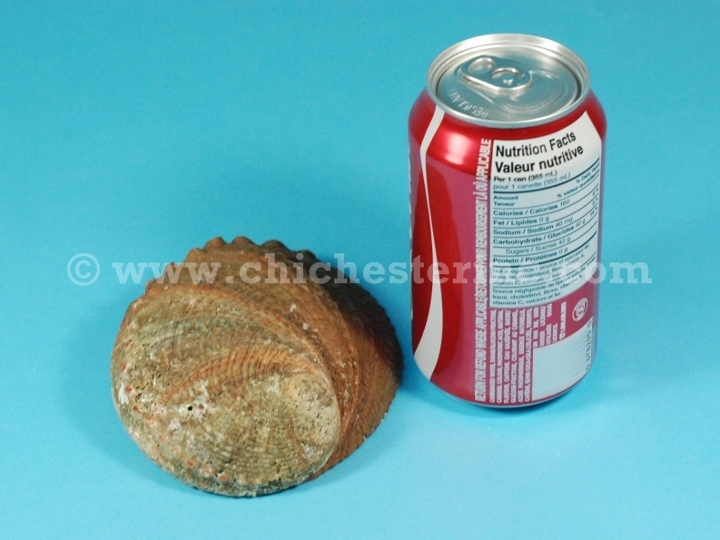 The cleaning and edging of the African shells is far superior to what we have seen from the Mexican shells. Often, the Mexican shells are varnished as well. From what I have seen lately, I much prefer the African shells to the Mexican ones. For the polished shells, there is not much difference in quality. 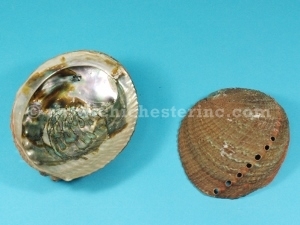 Click HERE for the African abalone shells. We can offer large volume shipments of African abalone shells. Please call Paul Crosby at +1.416.232.0376 or write to info@chichesterinc.com for more information.